In this Photoshop Effects tutorial, we'll learn how to create a fun and simple halftone pattern photo border using a couple of Photoshop's filters, a basic selection tool, a layer mask, and a layer blend mode. We'll be using Smart Filters to create the effect, which will allow us to easily make changes to the photo border after we've created it without having to undo or redo any steps. Smart Filters were first introduced in Photoshop CS3, which means you'll need at least Photoshop CS3 if you want the added benefits that Smart Filters offer (I'll be using Photoshop CS4 myself), but this effect can be created with any version of Photoshop, including Photoshop Elements, so don't lose hope just because you don't have CS3 or CS4. If you're using Photoshop CS2 or earlier, or Photoshop Elements, simply ignore the few steps that deal specifically with Smart Filters and apply regular filters to the layer as you normally would. The only thing you'll be missing out on is the added flexibility and editability that Smart Filters give us. The final halftone pattern photo border. 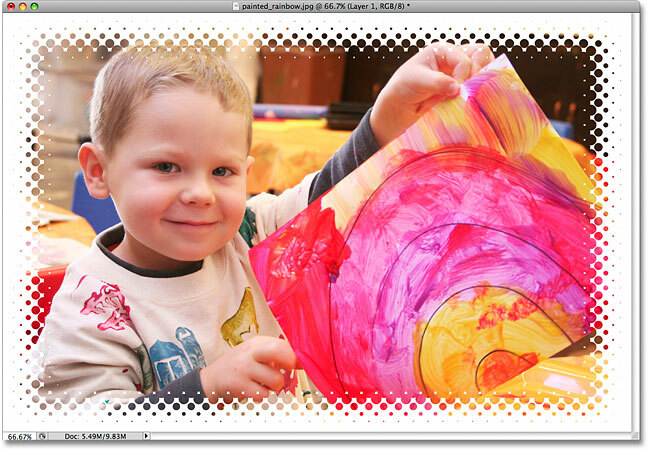 Click the New Layer icon to add a new blank layer above the Background layer. The preview thumbnail to the left of a layer's name shows us what's currently on the layer. A gray and white pattern means the layer is blank. The Fill command is one way to fill a layer or selection with a color in Photoshop. Since "Layer 1" is above the Background layer, the photo below it is temporarily blocked from view by the solid white fill color. The Rectangular Marquee Tool is one of Photoshop's basic selection tools. Try to leave an equal amount of space around each edge for the photo border. Choose Black this time as the fill color. If a selection is currently active, the Fill command will fill only the area inside the selection. If you're using Photoshop CS2 or earlier, or Photoshop Elements, you can skip this step since it only applies to Photoshop CS3 and higher. We're going to be applying a couple of Smart Filters to "Layer 1" which will allow us to go back and change the filter settings any time we want after we've created the initial photo border in order to fine-tune the effect. Before we can use Smart Filters though, we first need to convert our layer into a Smart Object. Applying one of Photoshop's standard filters to a Smart Object automatically converts the filter into a Smart Filter. Smart Objects first appeared in Photoshop CS2, followed by Smart Filters in Photoshop CS3. Converting a layer for Smart Filters simply converts the layer to a Smart Object. The icon in the bottom right corner of the preview thumbnail tells us the layer is a Smart Object. 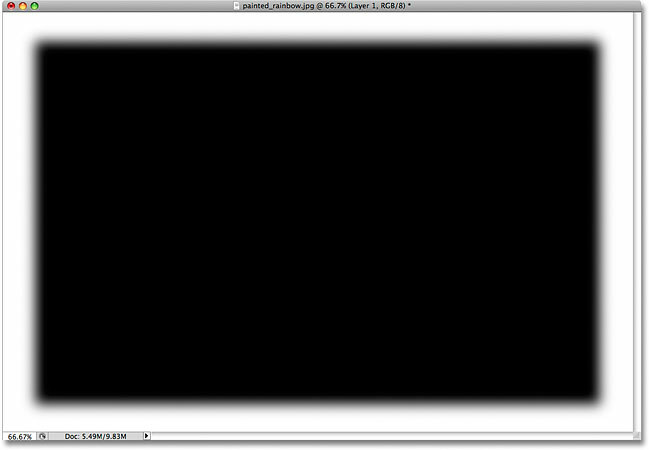 This brings up the Gaussian Blur filter's dialog box. 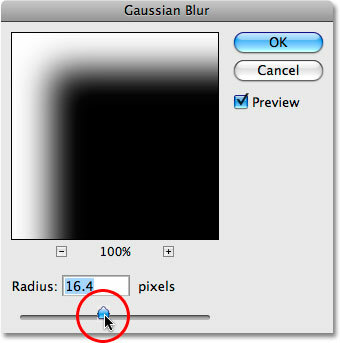 Soften the edges of the photo border by dragging the Radius slider at the bottom of the dialog box. The further you drag the slider towards the right, the more blurring you'll apply to the layer resulting in a wider transition area between the black part in the center and the white photo border around the edges. There's no specific radius value to use since it will depend on the size of the photo you're working on, with larger photos requiring larger radius values, so keep an eye on your image in the document window as you drag the slider to judge the results. Keep in mind that the width of the halftone pattern that we'll be adding in the next step will be determined by the width of the transition area that we set here. This is why Smart Filters make life so much easier, since we can easily go back and try different filter settings any time we want. Soften the edges between the white and black areas of the layer by adjusting the Radius value. A smooth transition area now appears between the black and white areas. Go to Filter > Pixelate > Color Halftone. This brings up Photoshop's Color Halftone dialog box. The Color Halftone filter was designed to simulate the look of a traditional four color offset printing press, converting the image into a series of overlapping colored dots at various sizes. If that was the effect we were aiming for here (which it isn't), we'd first need to convert our image from the RGB color mode to the CMYK color mode, since the filter requires four color channels (Cyan, Magenta, Yellow and Black) to work properly and the RGB color mode uses only three channels (Red, Green and Blue). However, we're simply using the filter to create a repeating pattern of circles, so there's no need to worry about which color mode we're working in. You're most likely working in the RGB color mode and that's fine for this effect. Set each Channel to 45 degrees, then set the size of the largest circles in the pattern with the Max Radius option. If you're using Photoshop CS3 or CS4 and you're not happy with the size of the dots in the pattern, continue on for now since we'll see how to edit the Smart Filter settings at the end of the tutorial. If you're using an older version of Photoshop and you want to try a different Max Radius value to change the size of the dots, press Ctrl+Z (Win) / Command+Z (Mac) to undo the last step, then repeat Step 7 again using a different value. You can undo the step and retry the filter with a different value as many times as needed. Change the blend mode of "Layer 1" to Screen. 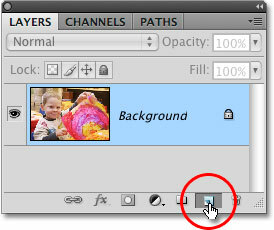 Double-click on the name of a Smart Filter in the Layers palette to edit the filter's settings. Try a different Max Radius value to adjust the size of the circles in the pattern. Smart Filters make it easy to experiment with different filter settings when creating effects. Unless you select the Don't show again option in the bottom left corner, you'll see this warning box any time you go to re-edit a Smart Filter that has other Smart Filters listed above it (in this case, the Color Halftone filter is listed above it), and you can safely click OK to exit out of it, at which point the filter's dialog box will appear. The warning simply tells us that Photoshop will be unable to show us a preview of how the changes we're making are affecting the other filters above it until we click OK and accept the changes. It's nothing to worry about since we can always go back and change the filter settings again if we don't like the results. I'm not going to bother editing my Gaussian Blur filter settings since I'm happy with the way my photo border looks, but be sure to play around on your own to see how incredibly easy it is to experiment with different filter settings thanks to Photoshop's Smart Filters. And there we have it! That's how to create a halftone pattern photo border with Photoshop! Visit our Photo Effects section for more Photoshop effects tutorials!